As mentioned in my previous post, the second half of Paul and Melanie Jackson's honeymoon was spent in Scotland. 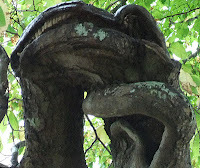 It comes as no surprise, therefore, to hear that they had an encounter with the Loch Ness Monster... or at least a reasonable simulacrum of Scotland's most famous cryptid (click the picture to see a larger version). 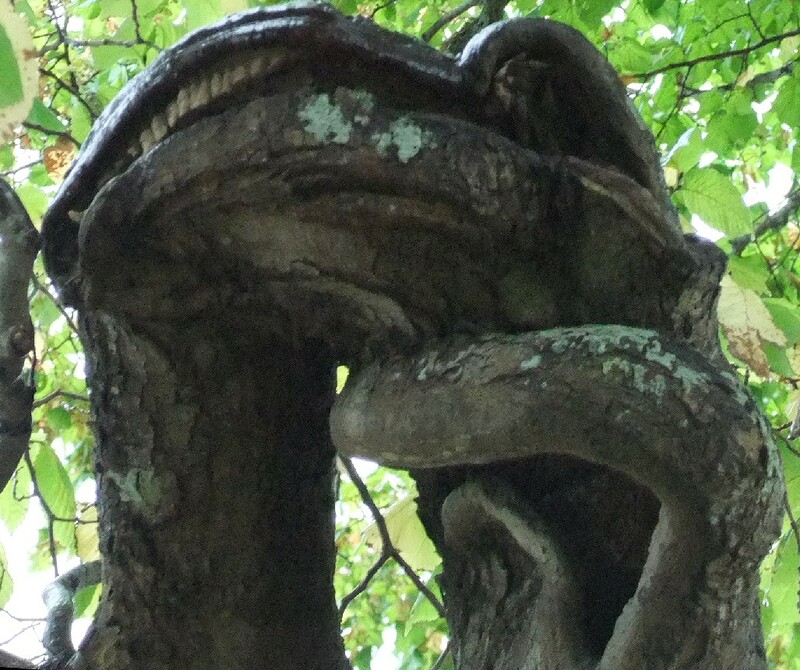 The photograph was taken at Fort Augustus at the Southern tip of Loch Ness, and depicts a tree branch that has apparently grown naturally into the distinctive shape of the monster's neck and head. However Paul suspects the teeth were added by a human hand! While in Scotland, Paul and Mel also came face-to-face with two other legends of the animal kingdom: Dolly the Sheep and Greyfriars Bobby. The former was the first artificially cloned mammal, while the latter was a dog who became famous for displaying exactly the sort of sentiment that sentimental humans think dogs ought to display. Dolly the Sheep was "born" in 1996 at the Roslin Institute just outside Edinburgh (I put "born" in quotes for dramatic impact, though sadly it's not really necessary: despite being genetically engineered, Dolly was born in the usual way -- not synthesized in a vat of bubbling nutrients as one might have hoped). 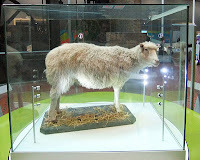 She died in 2003, after which she suffered the indignity of being stuffed and put on display at the National Museum of Scotland (right). 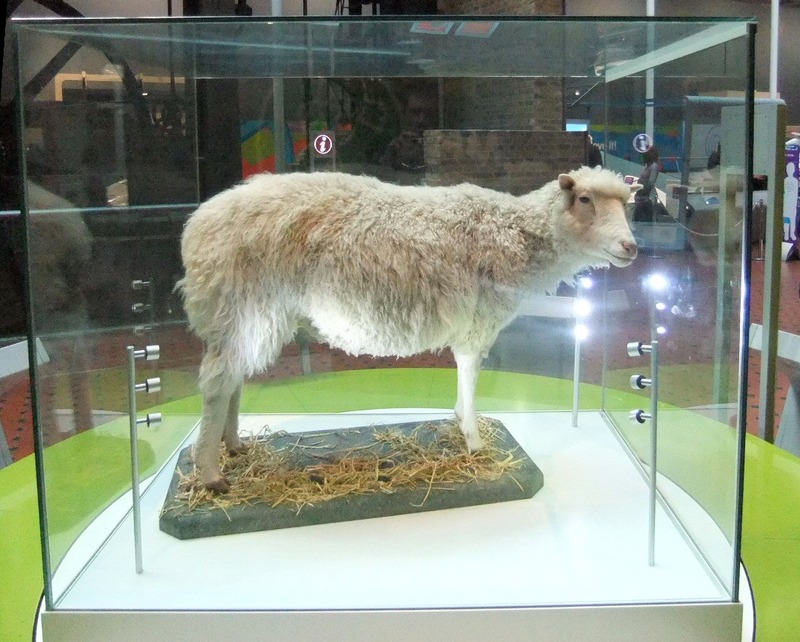 The birth, life and death of Dolly the Sheep were documented at the time with scientific precision. The same cannot be said of Greyfriars Bobby, the small dog who is supposed to have guarded his master's grave faithfully for fourteen years. As Jan Bondeson pointed out in his recent book Greyfriars Bobby: the Most Faithful Dog in the World , this supposedly well-established story is actually based on a confusing mish-mash of anecdotes, wishful thinking and possibly even outright deception. Jan's research was picked up by the British media earlier this year and reported quite widely (e.g. by The Daily Telegraph)... but it's a fairly safe prediction that the legend will live on unscathed. Why let facts get in the way of what everyone knows to be true? 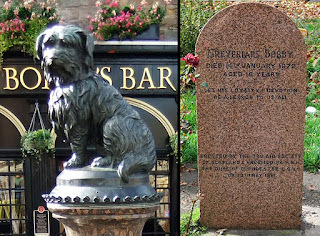 The picture below shows the tombstone of Greyfriars Bobby (which is revered by humans far more than that of his owner), as well as the nearby statue on Edinburgh's George IV Bridge.